This week I feel like nothing is going quite right. Our three month old has only been taking cat naps, so I haven’t had much time to work on my projects. 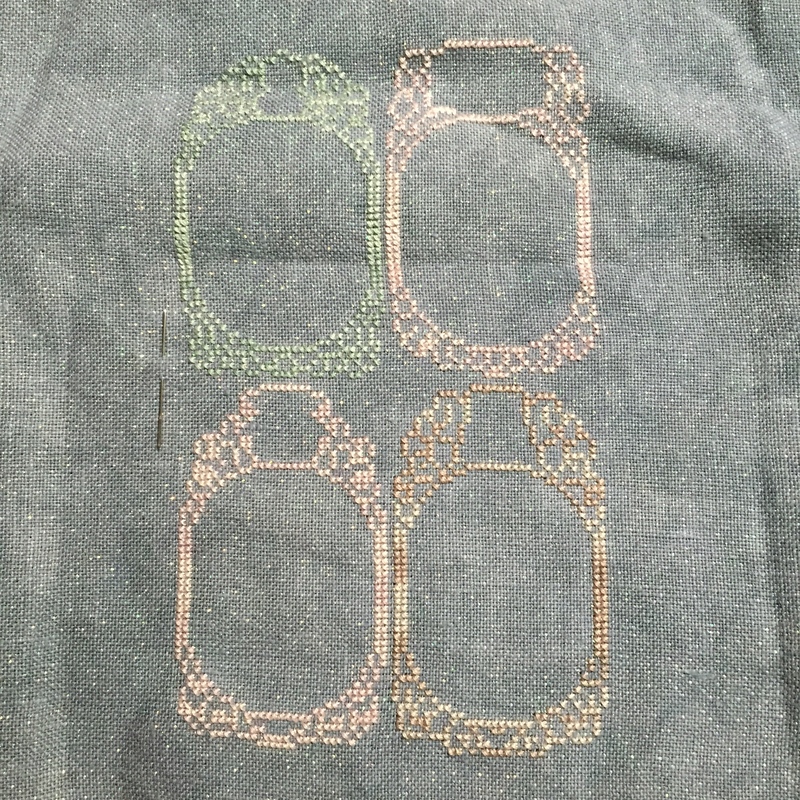 My Story Time Sampler hasn’t made much progress. 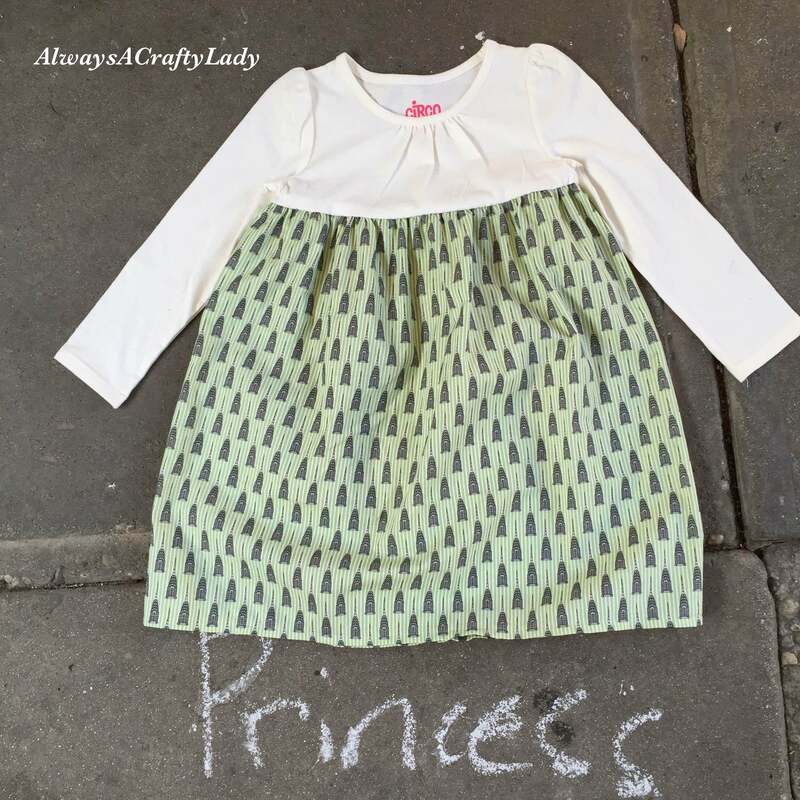 I tried to make a dress to fit my postpartum shape and it was a miserable fail (more on that later). 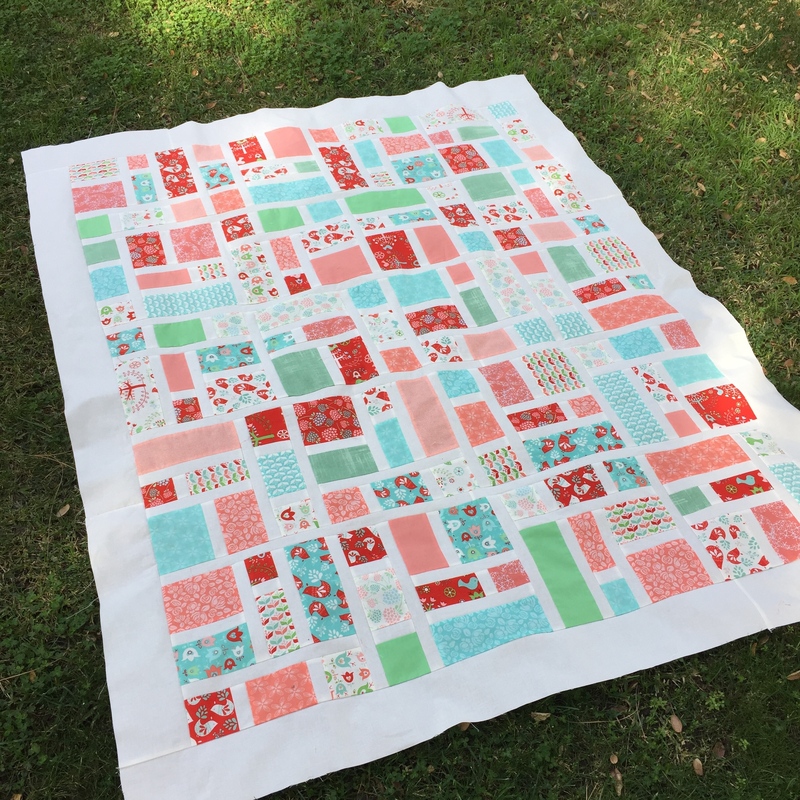 But I did get this beautiful quilt top pinned into its batting/backing sandwich today so tomorrow I can start quilting it all together…if I can pick a pattern. I’m feeling so indecisive. Anyone have a suggestion? Part of me wants to hand quilt it, but I think I would lose steam quickly. So I will most likely machine quilt it. Hopefully tomorrow I will wake up inspired. Moral of this story…not every project turns out perfectly the first time and not everything has to be made quickly. 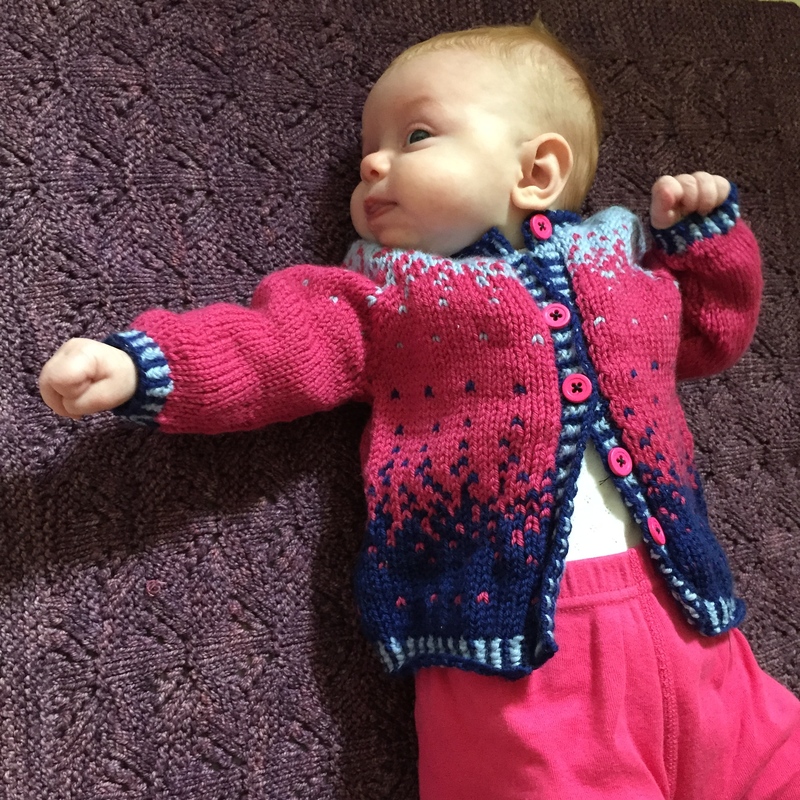 The moment I saw the Sugar Plum Cardigan by Jennifer Beaumont, I knew I wanted to make one for one of my girls. It is the cutest little sweater design. But it meant steeking. Eek! And stranded color work too. Something I hadn’t attempted in 4 years (and it didn’t go all that well). 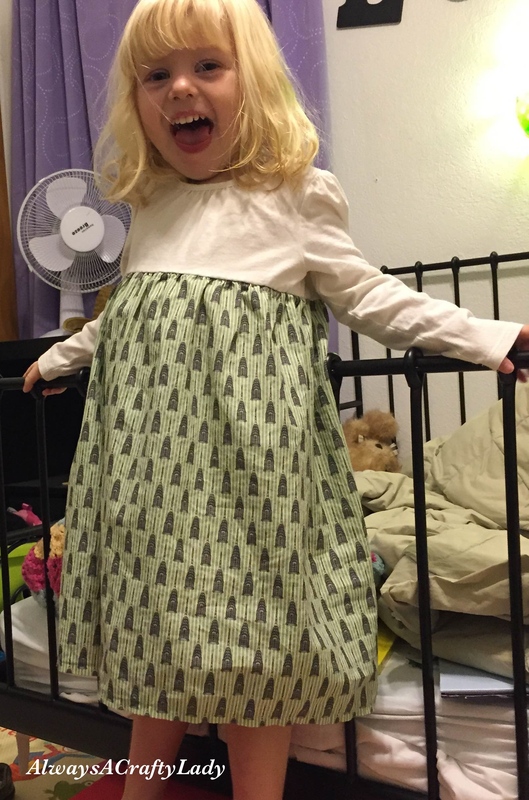 But it was a fun challenge and attempting a new-ish technique on a size 3 month garment is certainly a lot easier than on an adult garment. 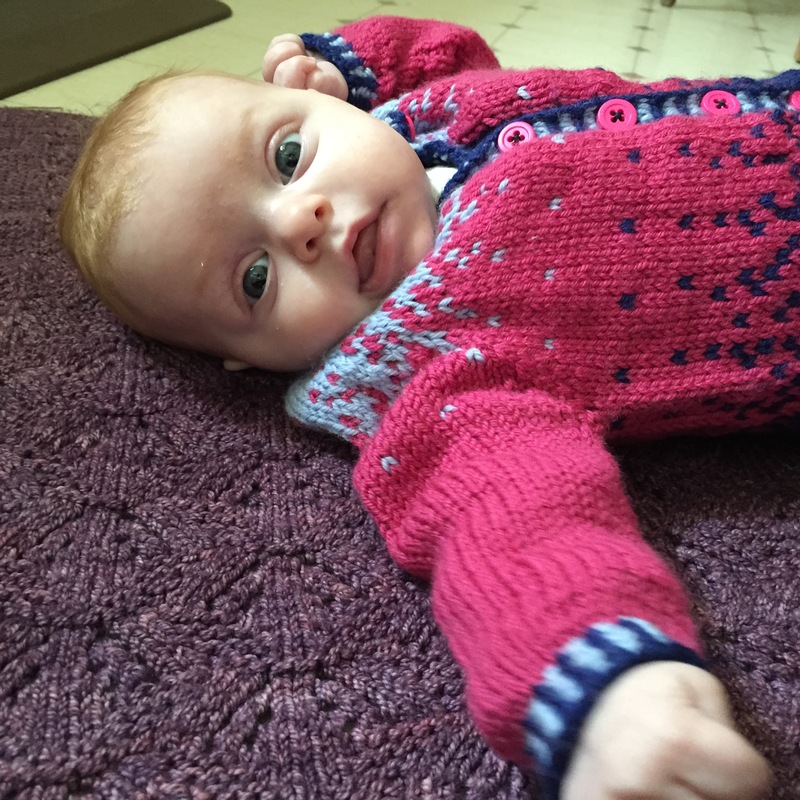 This little sweater was made with Cascade 220 Superwash in the colors baby denim, berry pink, and blue velvet. The pattern is worked top down with set in sleeves. 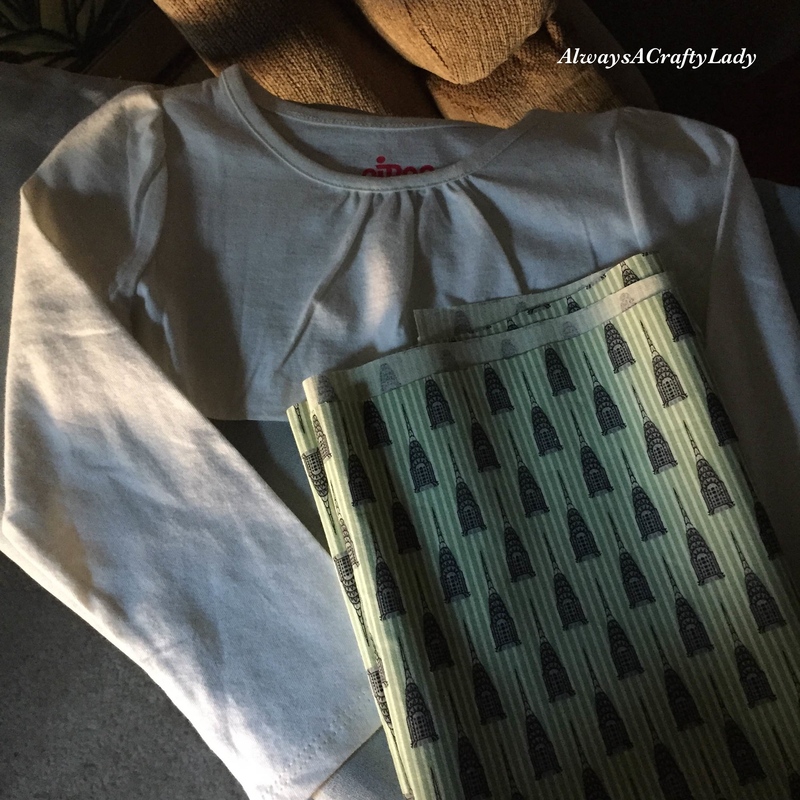 I wouldn’t say it was an easy pattern because not only is there steeking and color work, but you are also instructed to work the pixelated patterning while shaping the shoulders, sleeves, and neckline. But the end product is completely worth it and Jennifer’s instructions are perfectly clear. She has such a great sense of color that I encourage you to check out her designs! Darling daughter #2 will be 3 months old on Thursday. I was supposed to go back to work today, but I am thankful I am able to stay home with her an extra 5 weeks. So hopefully I will have time to make her more pretty things. 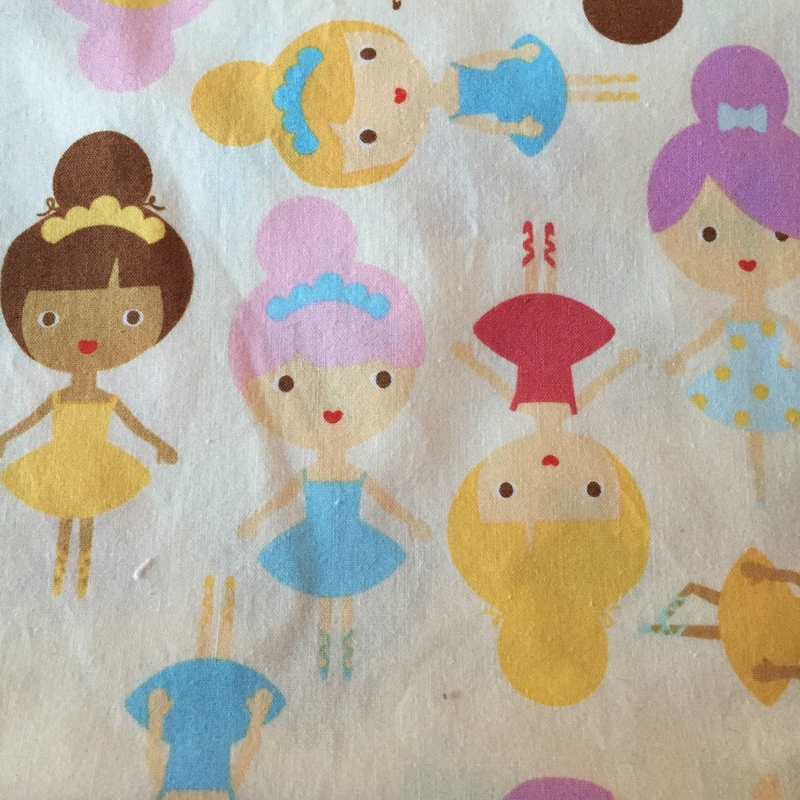 Anyone else working on The Frosted Pumpkin Stitchery’s 2015 Story Time Sampler? I haven’t finished a cross stitch project in years, but when I found out about the 2014 version I couldn’t wait to sign up for the 2015 stitch a long. This year’s version is going to feature some favorite characters from children’s literature, but before I can fill in January’s details (Alice in Wonderland), I need to finish all the prep. Four frames down, 8 more to go! I hope I can get to Alice before the next month’s pattern comes out on February 1st! 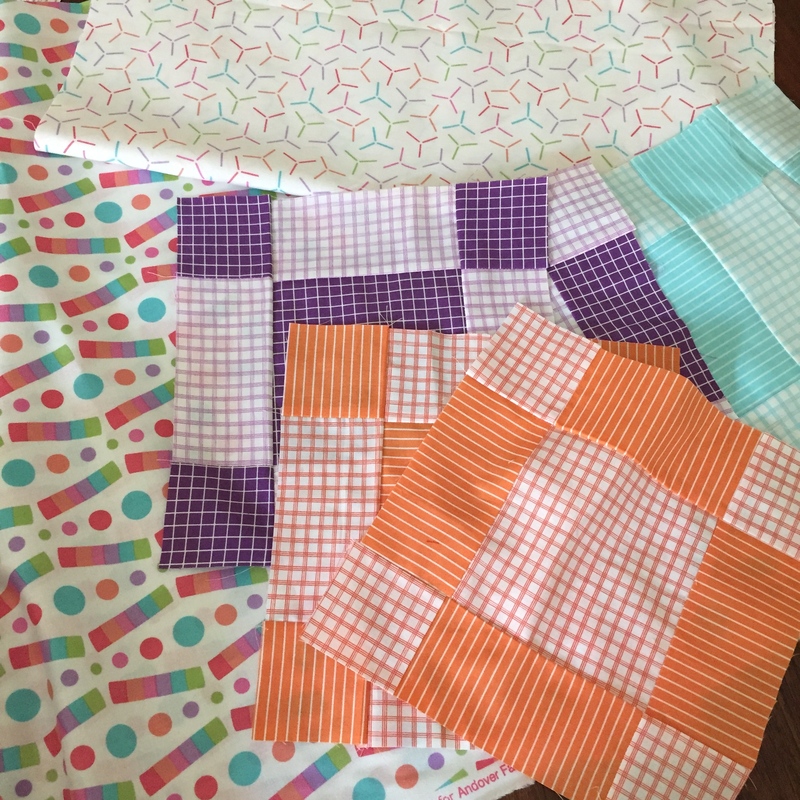 When I went to the quilt store to buy notions for the Rainbow Quilt I couldn’t help but also buy notions to make a doll sized quilt for the big sister. 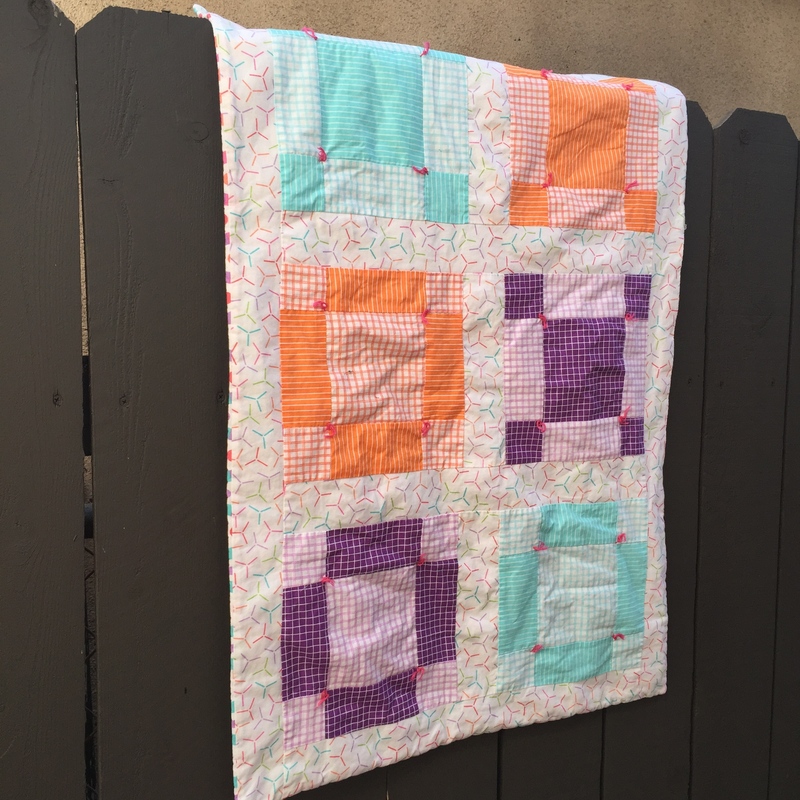 Same fat quarter set and block pattern, but a little different look. I love this little quilt. 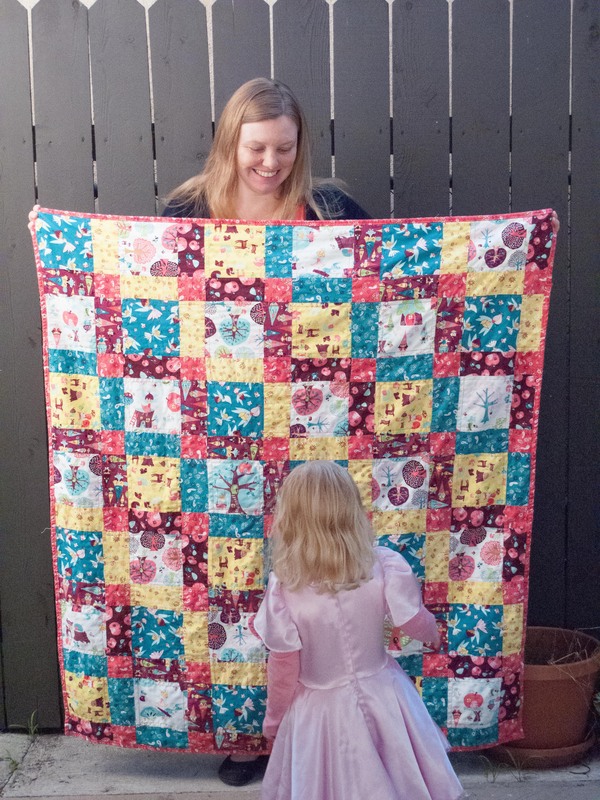 It was so sweet to put together and a great way to practice before I tackled the larger quilt. I put it away intending for it to be a Christmas gift, but then my older daughter received too many things and I knew this would get lost in the shuffle. So I held onto it until last week. Its now a wrinkled mess, but so so loved as my older girl insists on using it as a blanket even if it is much much too small for that purpose. And so here is the pair. 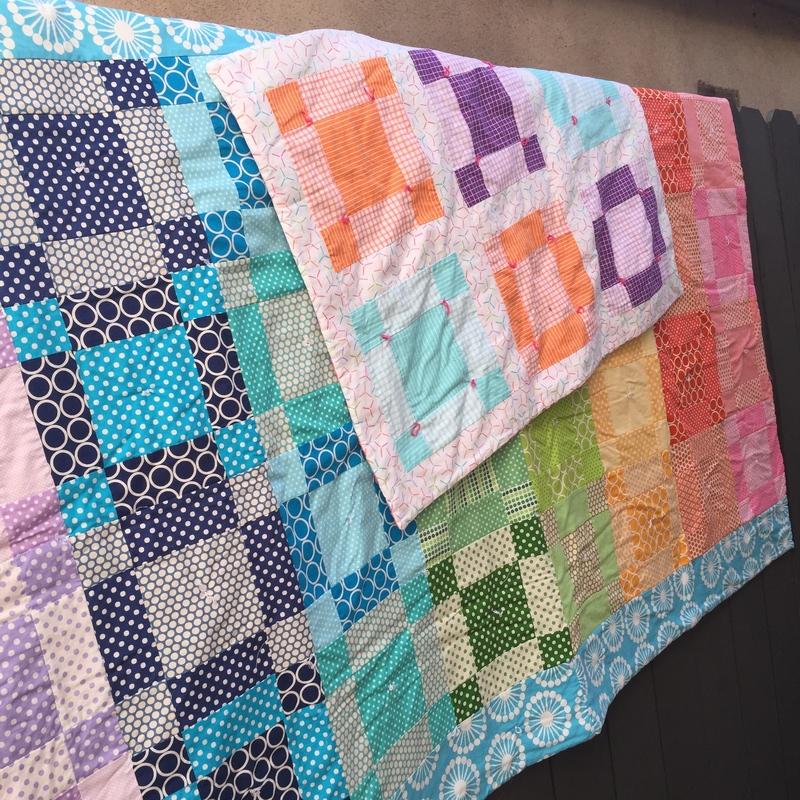 My first quilts that have started an obsession. 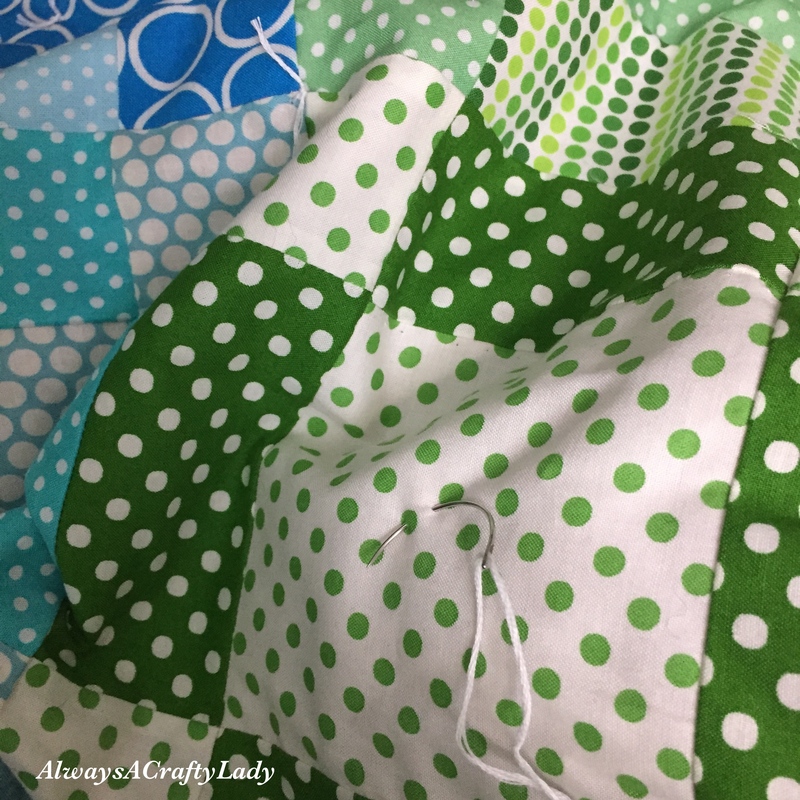 Last year I got bit by the quilting bug. Hard. 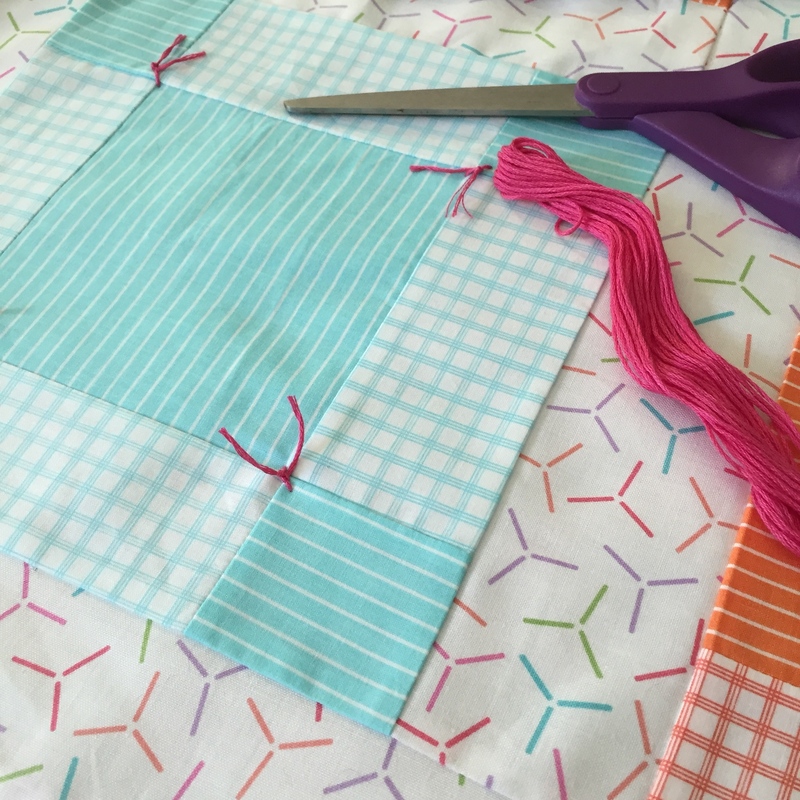 Call it a crazy pregnancy thing as I decided to take up quilting when I went to visit the Purl Soho warehouse in Orange County, California. 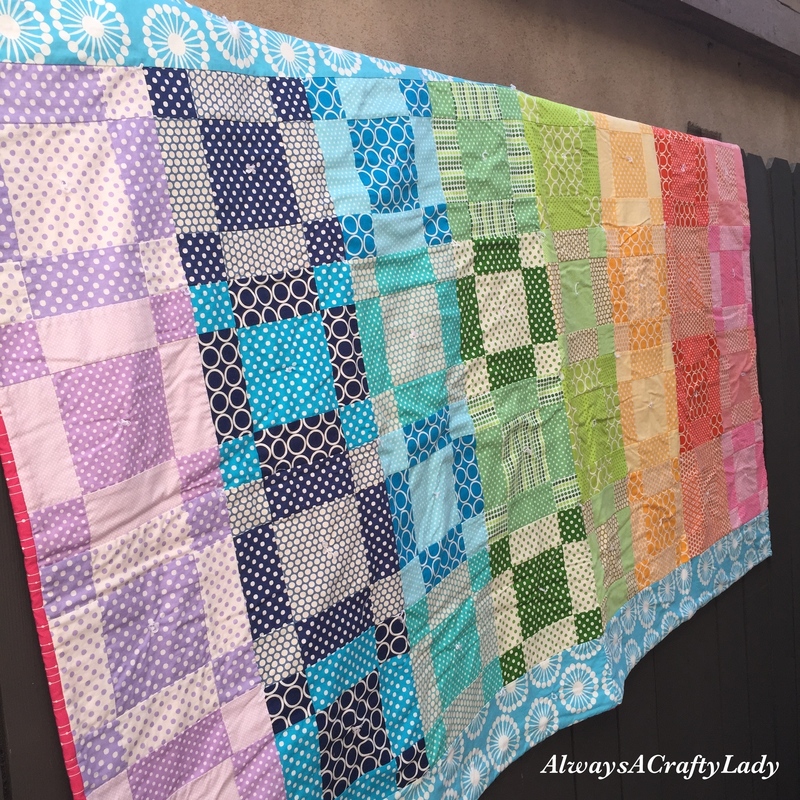 I found a package of 90 fat quarters in rainbow shades and just had to buy it to make a quilt for my then unborn second child. 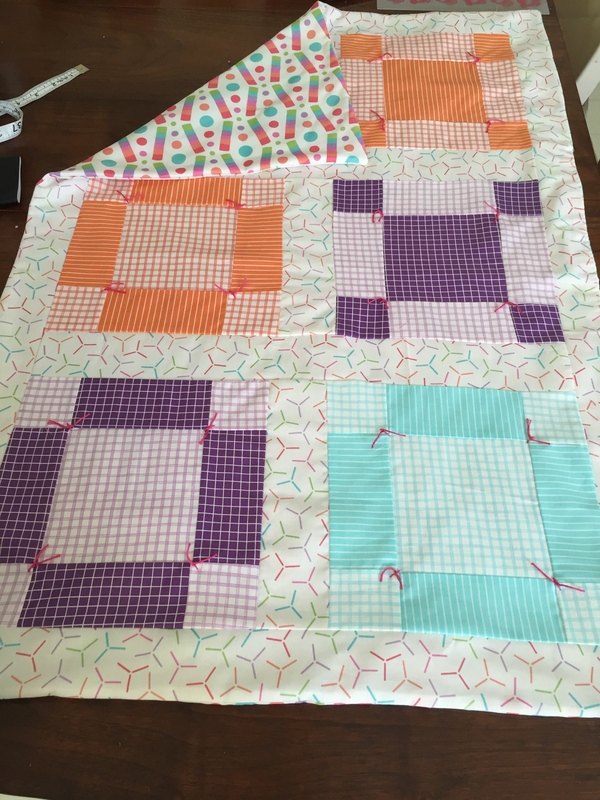 Problem was…I didn’t actually know how to make a quilt. But, no worries! I’d figure it out. And then the fabric sat. And sat. And sat just waiting for me to you know…get started. 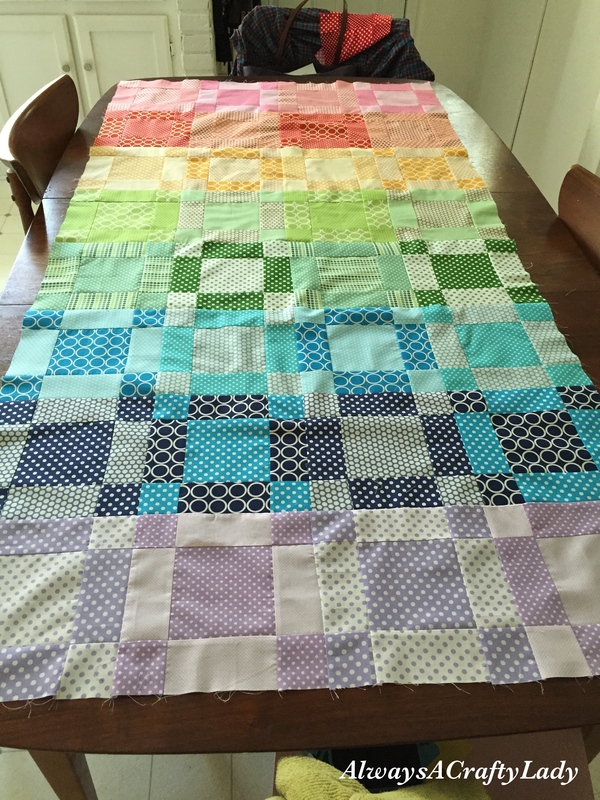 So when I went on maternity leave last October I finally got around to starting the quilt. The blocks went together quickly and easily. 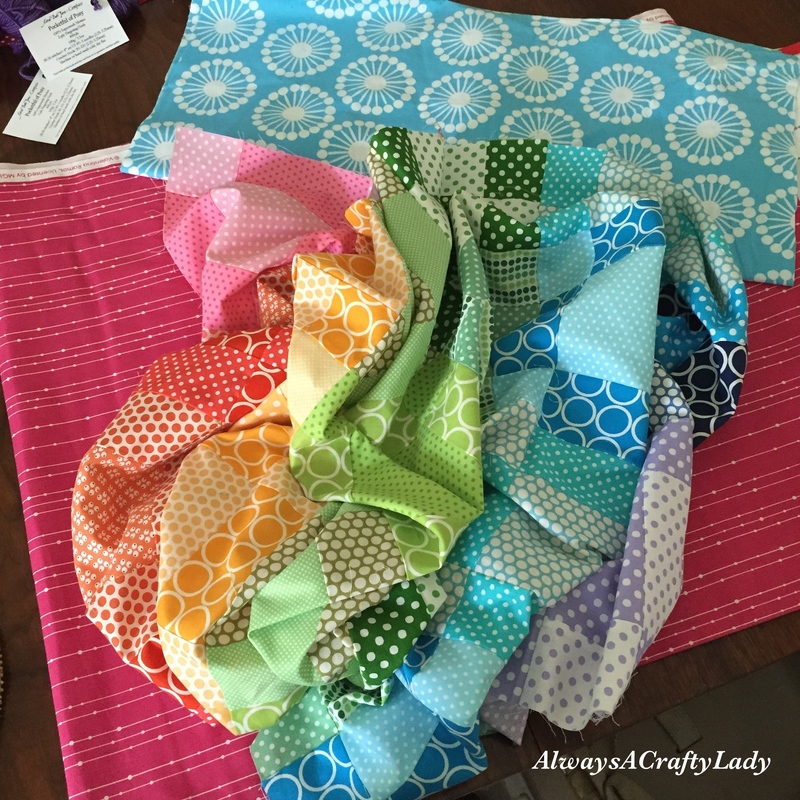 I went and bought backing fabric and notions. 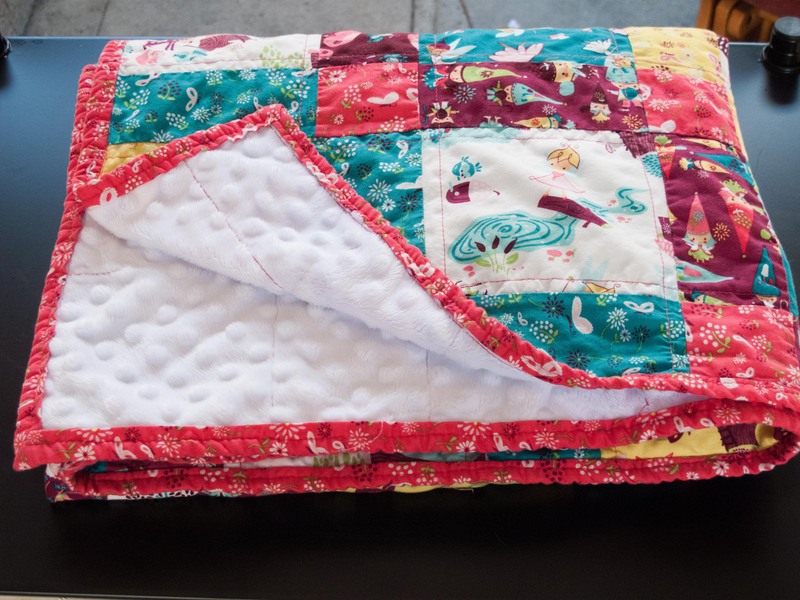 And then it sat around until a couple of weeks ago when I finally did the hand quilting. Having a 2 year old and a newborn will delay craft plans sometimes. 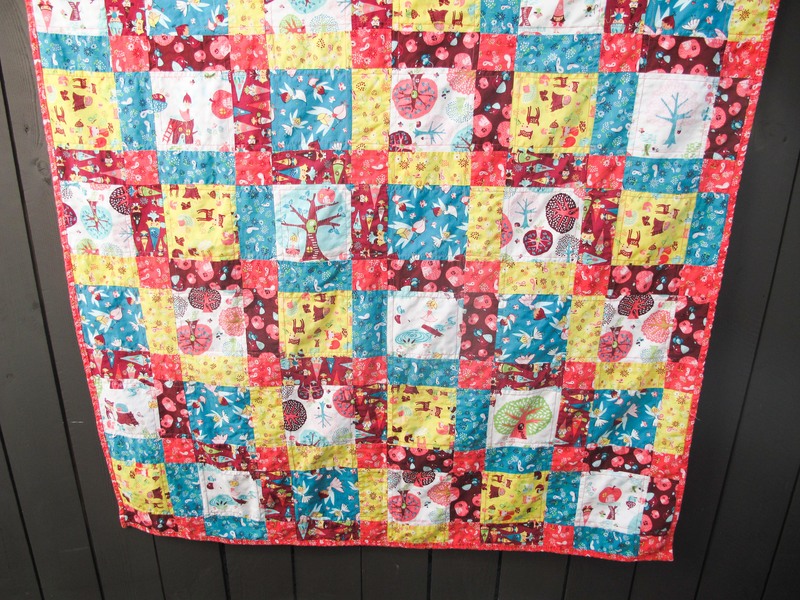 But the finished quilt is so very pretty and worth the delay in getting it all sew together. I think not bad for a first try.